develop sensitive stomachs over the years. Regardless of when your dog develops his sensitive stomach, you probably have some questions about it like what aggravates his stomach and what you should feed him now. Well, all the answers are right here for you! Some of these foods don’t even add any nutritional value and, if they do, they add very little of it. For instance, peanut hulls are commonly used as a filler because manufacturers can get lots of them at a very inexpensive price. Unfortunately, they don’t add any nutritional value and they’re very difficult for your dog’s stomach to digest. This is a more balanced diet, offering a better energy source from higher soluble fiber to make sure your dog received adequate, natural digestion. Understanding how important it is to feed your dog the right food for his sensitive stomach is great, but now you must know what brands come highly recommended here. Fortunately, most holistic dog foods work well for dogs with sensitive stomachs because they don’t contain any sweeteners or preservative chemicals nor do they contain much salt. However, there are some specific brands that are better than others. Nature’s Variety is an innovator in the limited ingredient dog food market. Their laser focus on only providing one protein and one carbohydrate in their food is great for dogs with sensitive stomachs. They’re just as concerned about what ingredients they don’t include in their foods. These ingredients include chicken, beef, fish, eggs, dairy, grain and gluten. While you won’t ever find any of these things in this dog food, they do freeze dry a special coating on the outside of each kibble so it’s even tastier for your dog. With such high standards, you can’t go wrong with this dog food. Blue Buffalo definitely markets itself as a “limited ingredient” product, which means it only has one meat and one carbohydrate (e.g. turkey and potato). This is why the brand consistently receives some of the best reviews from dog owners who are combating chronic digestive problems with their dogs. So, what’s in this formula? One thing you’ll notice is it has more meat than any other ingredient. Here you have your choice of turkey or salmon. While these are two types of meat your dog typically doesn’t eat, the nice thing is the salmon is high in omega-three fatty acids. These help with skin allergies, something many dogs with sensitive stomachs also struggle with. You’ll want to keep an eye on your dog’s weight if you choose to feed this formula because it’s quite high in carbohydrates. Instead of containing wheat, Blue Buffalo adds oatmeal, rice, and pea starch. Nonetheless, this is still one of the most highly recommended limited ingredient dog foods available today. 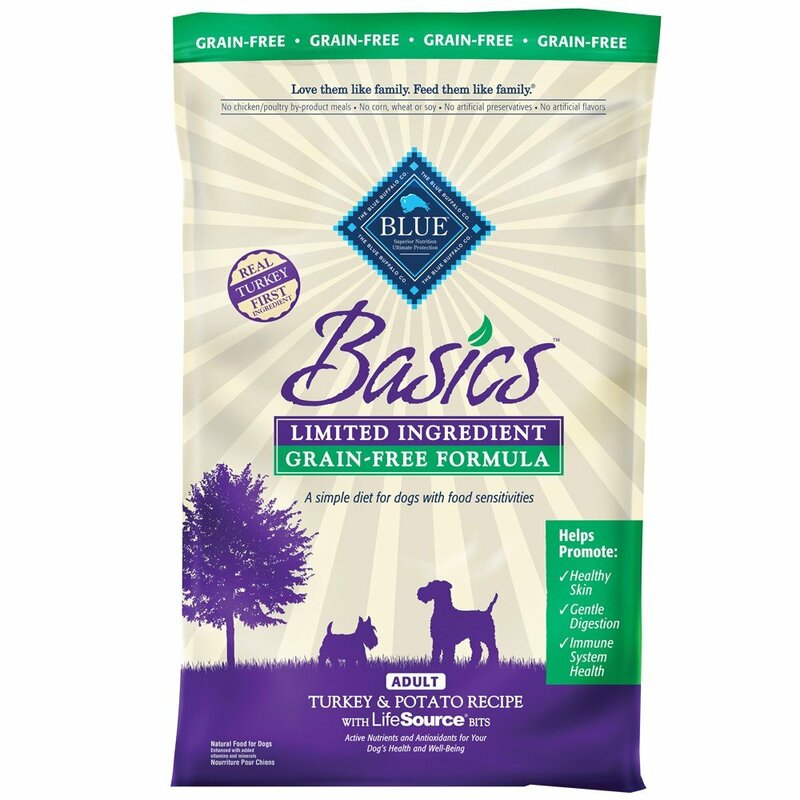 This is a hypoallergenic food that tends to rank higher than Blue Buffalo on Amazon. While this rating does fluctuate, it does show this is a high-quality food. One of the nice things about the Wellness Simple Series is they have many different foods available for you to choose from (e.g. Salmon and Potato, Duck and Oatmeal). This allows you to experiment in finding which is best suited for your dog. Another nice thing about the Wellness Simple Series is it’s only half the price of the Blue Buffalo. Some dogs will need something more aggressive than this formula, though. For these dogs, Blue Buffalo is definitely better. Nonetheless, you can always try the Wellness Simple Series first. 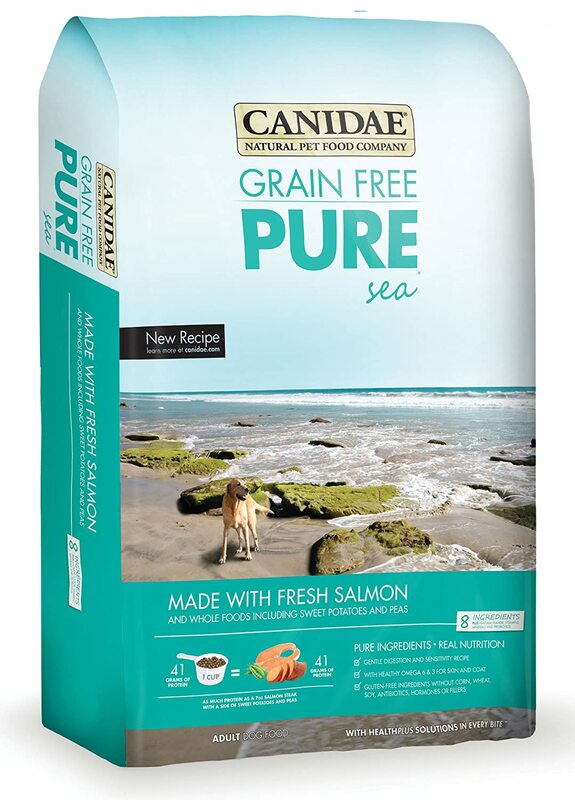 Oftentimes Canidae Salmon Meal gets overlooked because it doesn’t market itself as a “limited ingredient” dog food. However, it does offer a one-of-a-kind formula, which has a very high amount of protein. At the same time it also continues to support a healthy balance of veggies and grain-free carbohydrates. The nice thing about Canidae Salmon Meal is it also includes a healthy amount of fermented foods and normal bacteria, which is important for replenishing your dog’s gut. Sometimes this steady supply of flora can help rebuild your dog’s digestion so he can overcome his food sensitivities. 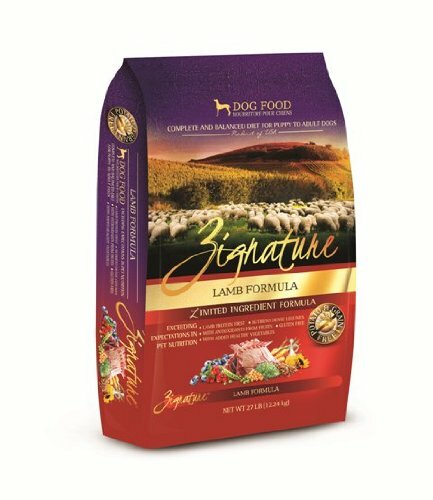 Another brand many dog owners like is Zignature Limited Ingredient Dog Food. This brand doesn’t contain any fillers, grains, potatoes, chicken, calories, or fat. Now you’re probably wondering what it does contain. Well, that’s simple. It has high-quality animal protein from trout and salmon (the first item mentioned on its list of ingredients), along with vitamins, minerals, omega fatty acids and many other healthy ingredients your dog should eat. Nevertheless, it’s big on taste! Your dog gets high-quality protein and complex carbohydrates in every bite. While the aforementioned foods are great for adult dogs with sensitive stomachs, if you have a puppy with a sensitive stomach, you’ll need something that meets their nutritional needs. 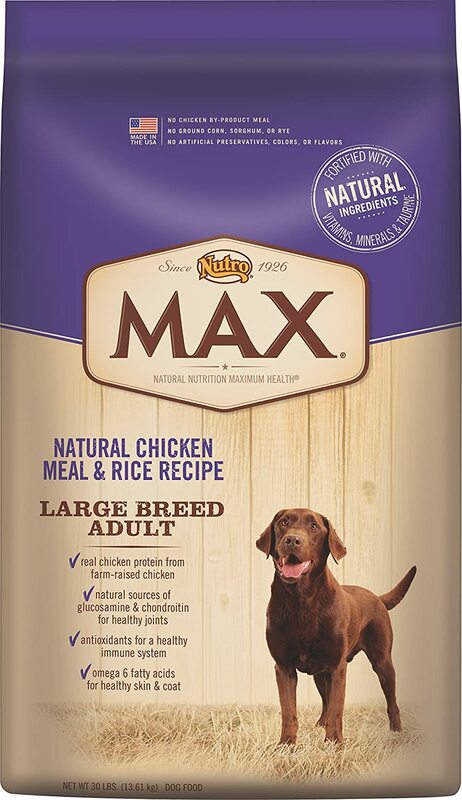 The best choice here is Nutro Max, which is specifically designed to nourish him while also catering to his sensitive stomach. At the same time, it also has the essential fatty acids he needs for optimal brain development. This formula is also specifically designed to soothe his upset stomach. All of this is thanks to the super-nutritious ingredients (e.g. free-range chicken, plenty of DHA). Oftentimes the simple advertising on this food allows it to get overlooked. Many advertisers don’t market it as a “limited ingredient” food either, although it does contain very limited ingredients. For this reason, many puppies with sensitive stomachs have had excellent results with this food. It also gets some of the highest ratings in the industry. 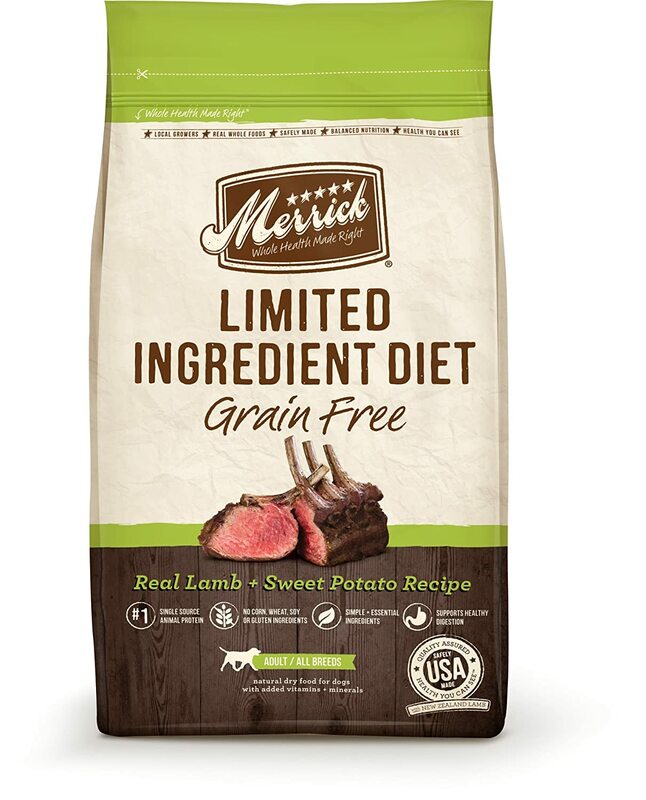 Merrick Limited Ingredient Dry Dog Food consists of a simple recipe that still offers complete, balanced nutrition, which comes from a single source of animal protein. The company mixes protein with only the most essential natural ingredients (no grains, corn, soy, gluten, artificial colors, flavors or preservatives). Typically, the first ingredient you’ll see on a bag of Merrick Limited Ingredient Dry Dog Food is deboned fish because the company believes it offers important amino acids, vitamins and minerals to help your dog have healthy skin and a shiny coat. There’s also industry-leading, guaranteed levels of glucosamine and chondroitin, which are known to help with arthritis. Some of you out there are probably thinking this all sounds great, but how can you afford it. Fortunately, there’s one brand who also thinks the same way you do. Natural Balance’s limited ingredient dog food keeps its price down by including more potatoes than meat. Nonetheless, they’re still able to meet your dog’s nutritional requirements without breaking your budget. 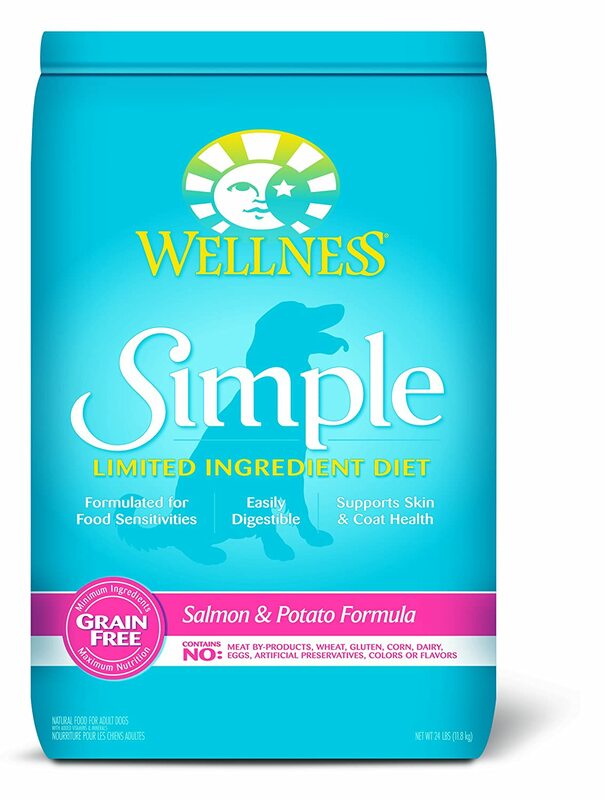 What’s really neat about this brand though is in comparison to the other limited ingredient dog foods on the market Natural Balance has the widest array of limited ingredient options to choose from. Your knowledge of this subject empowers your dog to live a long, healthy life, but only if you’re willing to also make some changes in his diet. While some dogs are resistant to a change in food, you should still slowly phase out the food that’s making them sick. A little time and patience will go a long way here. Saniya A is a cat crazy lady who contributes to the content as well as steering the direction of the website. She loves her two cats Snowie and Tom and has much to say in the matters of cat care and training. Another best way to feed a dog is to feed it with synthetically improved dog foods for about 2-3 times a week. It’s still much better to let them chow down organic and naturally made food. Thanks for sharing this one by the way!